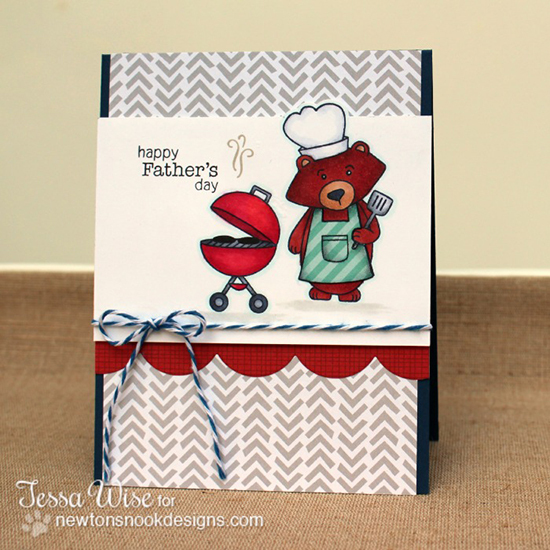 Winston is back again today - This time he's grilling up some goodies in this adorable card by Tessa Wise. Tessa used our new Winston's BBQ to create this cute little scene for Father's Day! The masculine patterns and colors on this card make it perfect for that special guy. I love the striped apron too! To see more of Tessa's fun cards, make sure you pop over to Tessa's blog, Crafty Girl Designs and say hello! Everything about this card is just AWESOME! Great work, Tessa!! oh my goodness!! this is an adorable card!! i LOOOOVE that background paper!! and winston's striped apron is my favortie!!! So charming! He's colored to perfection! Great colours for this Father's day card. Perfect Father's Day card...colours, image and that striped apron is such a special touch!